Media captionPiers Hanson walked down the tracks after receiving what he says was "clearance from police"
Train bosses have been accused of "inadequate management" after passengers stranded on a broken-down train forced their way out onto potentially live tracks. Passengers got off the Southeastern train at Lewisham station in March 2018 during the Beast from the East which caused freezing temperatures. An independent report found they could have been electrocuted. Network Rail said it had worked with Southeastern to improve management. The train was stuck behind another train which could not move due to ice on the tracks for about an hour on 2 March, an investigation by the Rail Accident Investigation Branch (RAIB) said. But instead of diverting to another platform, managers decided to route the train directly behind another which then also struggled to move - further extending the delay. Seven more trains became trapped. 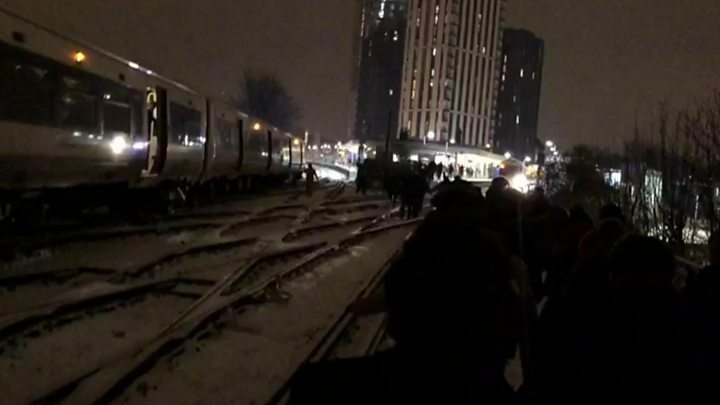 When passengers, who were getting "increasingly uncomfortable in crowded carriages with no toilet facilities", decided to leave the train, the tracks were eventually turned off and stranded trains were not able to move again until the power was restored nearly four-and-a-half hours later, the report said. The RAIB criticised "inadequate management of the disruption caused by the adverse weather" as well as an "ill-defined incident management processes". It called on Network Rail and Southeastern to review their "seasonal preparedness arrangements for winter", systems and provide staff training. The rail operator should consider improving facilities on its trains when they are stranded, such as toilet, heating, ventilation, passenger information, food and drink, according to the report. Network Rail and Southeastern said they were "really sorry to passengers who were on board for what was an unpleasant and distressing experience" and had "taken action to minimise the chance of this happening again". Their joint statement continued: "We have improved the way we manage extreme weather, examined ways to keep the power on when the conductor rail fails and updated our procedures for communicating with passengers during emergencies."